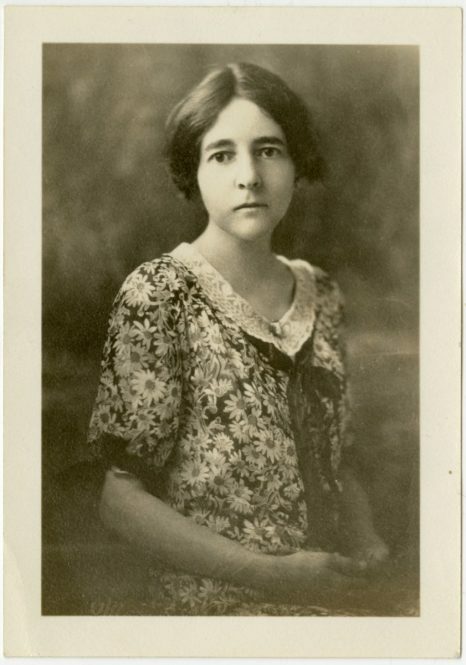 Viola Chittenden White (1890-1977) was hired as Middlebury College’s first Curator of the Abernethy Library of American Literature in 1933 and held this title (and later the additional title of Assistant Professor) until her retirement in 1956. Raised in Brooklyn, White graduated from Wellesley College in 1911 and drifted between jobs, too independent to settle into the limited professional roles open to women at the time. Her real devotions were progressive politics and poetry. Her first published book of poetry, Horizons, was the first volume by a woman to be included in the selective Yale Series for Younger Poets. It was followed by Hours of Judgment (1923) and Blue Forest (1929). She earned a master’s degree from Columbia University in 1931 and a Ph.D. from the University of North Carolina in 1934. Viola White’s contributions to Middlebury College stem from her role as writer, naturalist, and librarian. While at Middlebury, she built one of the strongest collections of American literature in the country. In 1938, she purchased two rare manuscripts by Emily Dickinson and a first edition copy of Walt Whitman’s Leaves of Grass. A year later, she acquired one of Middlebury’s single most valuable books: Henry David Thoreau’s personal copy of Walden with his handwritten corrections.